A diverse gastropub debuts in San Francisco, Portland gets a new rooftop venue and more. Myriad Gastro Pub in San Francisco serves upscale cuisine made with local ingredients and features a long list of global wine offerings, craft beer labels and fortified wine cocktails. Named for its varied and frequently updated menu, Myriad Gastro Pub opened in June in San Francisco’s Mission District. The sophisticated venue, helmed by chef Patricia Tracey, features a worldly menu that highlights local ingredients, offering snacks and small plates alongside larger entrées. The debut menu lists such starters as potted chicken liver mousse, salt-cod fritters and bone marrow with a Sherry demi-glace, as well as larger plates like a roasted lamb sandwich with Moroccan tomato jam, Mayan pork stew and roasted halibut with clams (small plates are $8 to $13; entrées are $14 to $28). The tavern has a lengthy list of wines and beers, as well as fortified wine cocktails. Standouts include the Bollywood Tea, mixing Graham’s Fine Ruby Port, Ramos Pinto White Port, Ku soju, chai concentrate, lemon juice, soda water and cream, and the Wayfarer, blending Giovanni Bosca Cardamaro Vino amaro, Hidalgo Napoleon Amontillado Sherry, Keo St. John Commandaria dessert wine and Angostura bitters (cocktails are $9 to $12). Myriad’s global wine menu lists labels from California, Latin America and Europe and boasts nearly 20 glass pours ($8 to $14 a glass; $32 to $78 a 750-ml. bottle). These offerings are joined by a variety of craft beers ($5 to $20 a glass pour or bottle). 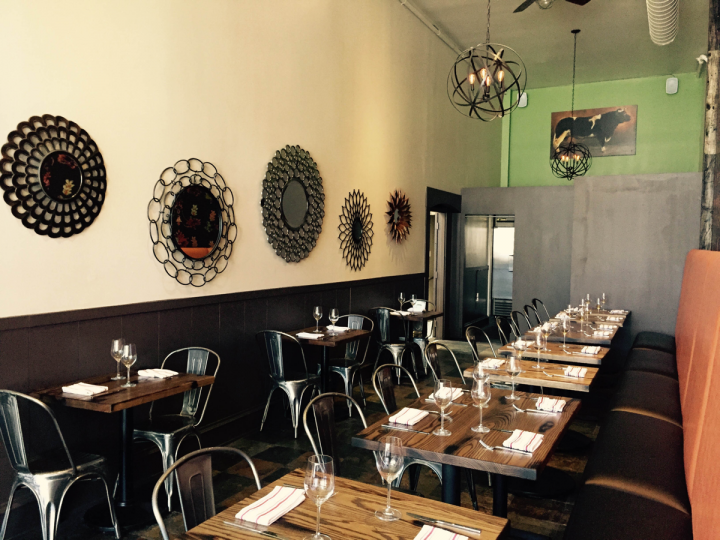 The 65-seat gastropub has a modern interior with vintage accents. 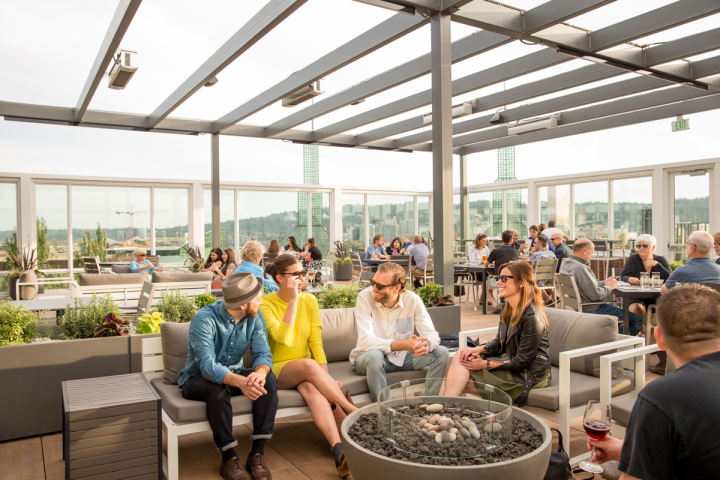 Portland, Oregon’s Hotel Eastlund opened in June in the city’s Downtown area with the rooftop restaurant and bar Altabira City Tavern. Boasting an outdoor terrace and a modern interior with sweeping views of the city, Altabira emphasizes local beers and spirits and offers food and drink pairings. The venue’s American cuisine includes braised rabbit, smoked beef brisket and roasted chicken, with many dishes incorporating beer (entrées are $18 to $24). Appetizers highlight seafood like barbecued oysters, steamed mussels and house-cured salmon ($9 to $14). Altabira has 16 draft handles for Oregon and California brews and 40-plus bottled beers from around the world ($4 to $8). The venue also features specialty cocktails ($10 to $12) and wines from the Pacific Northwest and Europe ($7 to $12 a glass; $26 to $68 a 750-ml. bottle). The founder and CEO of Planet Hollywood and the owner of Buca di Beppo launched a new Mexican concept called Tequila Taqueria in June. Located in Bally’s Las Vegas Hotel and Casino, the eatery lists several types of tacos and other dishes, as well as nearly 40 Tequilas and 10 Mexican beers. Inspired by the breweries of Lisbon and named after the Portuguese word for “hops,” Lupulo opened in June in New York City. The eatery serves rustic Portuguese comfort food and boasts an extensive menu of craft beers, including labels from Portugal and New York. Lupulo also offers cocktails and wine, a raw bar, and a charcuterie station. Chef Akasha Richmond opened her second venue in June with the debut of Sāmbār in Culver City, California. The restaurant showcases Indian cuisine, with many dishes featuring familiar California ingredients, and its beverage program includes spice-driven cocktails and rare spirits. Long Island’s Wölffer Estate Vineyard unveiled the first winery-owned restaurant in the Hamptons this summer. Located in Sag Harbor, New York, the casual neighborhood eatery serves local, seasonal fare. The wine menu lists Wölffer labels, as well as other New York–made wines, beers, ciders and spirits.